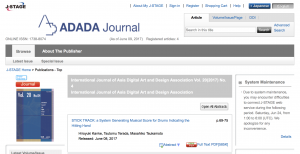 ADADA International Journal now available on the J-Stage. In order to support the information transmission function of user organizations, the “Japan Science and Technology Information Aggregator, Electronic” (J-STAGE), developed by Japan Science and Technology Agency (JST), has set up the hardware and software necessary for electronic journal publishing within JST to provide services 24 hours a day, 7 days a week. By taking advantage of this hardware and software, user organizations are able to digitize currently published journals of academic societies and research papers with ease and at low cost. Digitized documents can be accessed from anywhere in the world with this system. This project also links up with the National Institute of Informatics (NII), the National Diet Library (NDL), and Japan Link Center (JaLC).